"...has a feature called "auto adjust tone" and I can lighten up the videos that came out really dark. 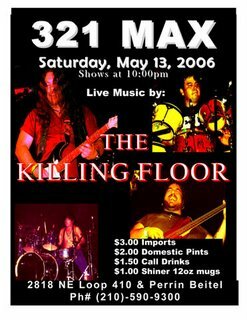 I tested it out on the recent video I took of The Killing Floor playing "Voodoo Chile" at 321 Max. It came out much better. The clips are larger and grainier, but now you can SEE THEM! They're also in wmv format, which means they're much smaller in file size. There are two clips over on the Video Page - one of the guitar solo and one of a jam with JCM on guitar with Tom Rimes on alto sax. So check those out, too." Featuring Tom Rimes (Larry's brother) tossing in some beautiful sax on Voodoo Chile at 321 Max. ...love a jam session like that! Thank you for catching 'em Rowan.